Foster’s come a long way since he first arrived at Ability nearly nine years ago. He wanted to share his story as a thank-you for all the support that has helped him get this far. Originally from Ghana, Foster moved to the UK in 1995, seeking asylum from conflict he was facing there. Foster soon passed his driving test and got a job as a car valet. However, in 2003 he became mentally unwell. He was sleeping rough and ended up in hospital. After being discharged, Foster arrived at Ability where he said his life started to change. Foster was first housed in one of Ability’s older style shared properties and although the building “wasn’t much to look at”, Foster was impressed by “the lovely staff at Ability”. He says it was the great staff and their support, as well as his strong faith, that got him through his times of hardship. Over time, Foster’s mental health improved and he became more independent and keen to take an active role in the community and improve his skills. He volunteers two days a week at the British Heart Foundation shop and was a ‘Games Maker’ at the London Olympics. He also achieved certificates from the South London NHS Trust in ‘Understanding psychosis and schizophrenia’ and ‘Moving into work’. At Ability, Foster trained to help other customers with tasks that they might find difficult. 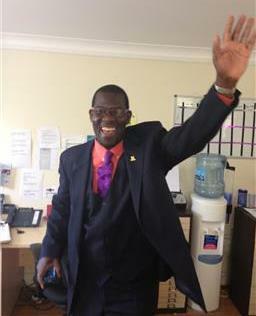 He joined Ability’s Q-Team and has been taking part in peer audits with customers at Ability services. He is also a customer volunteer on Ability recruitment panels for new support staff. Foster feels he has gained some really valuable experience and useful skills. He is really excited to be moving to his own home in south London. He says, “I feel confident enough to live on my own now. My life has been a battle of ups and downs, but I now feel ready”.